This handy impulse sealer will seal and trim your bags in one operation. This produces a consistent seal without the need for a second operation to trim the excess plastic. Great for for use with continuous poly tube stock. 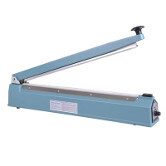 This 12" impulse sealer will seal and trim your bags in one operation. This produces a consistent seal without the need for a second operation to trim the excess plastic. Great for for use with continuous poly tube stock. 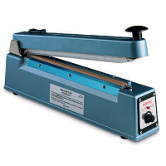 This 16" impulse sealer will seal and trim your bags in one operation. This produces a consistent seal without the need for a second operation to trim the excess plastic. Great for for use with continuous poly tube stock.